suituapui – …STILL CRAZY AFTER ALL THESE YEARS! Ancient relic but very young at heart. Enjoys food and cooking...and travelling and being with friends. 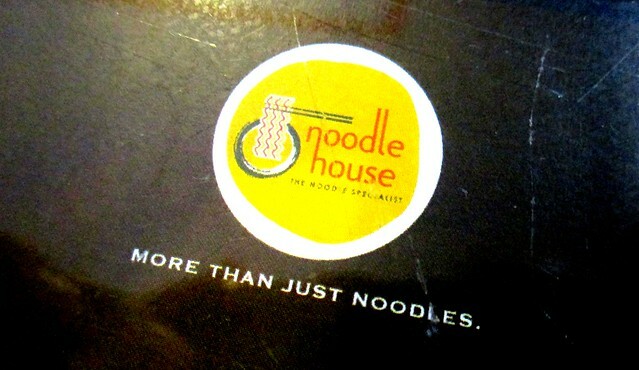 Unlike the place in my previous post, this one is true to its name – the food is nice and it’s affordable too! This is the favourite of my cousin in Sydney, Australia – he would not fail to drop by every year when he comes back in December around Christmas. 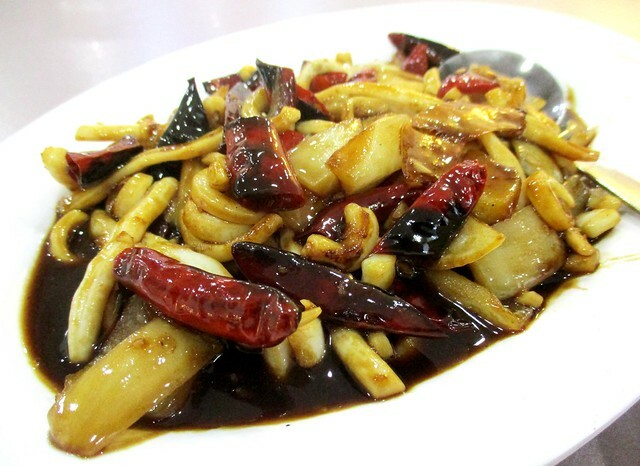 He particularly likes how the dishes here are mild, not quite the stuff you will get at the regular chu char (cook & fry) places around town where the food would be pretty much the same – generally, it is more or less a case of you’ve tried one, you’ve tried them all. Well, we were fasting all day Friday last week, Good Friday and after the mid-afternoon service at the church that we frequent here, when evening fell, we dropped by here for dinner, the breaking of fast, so to speak. It was a day of abstinence (from meat) too so we did not order any meat dishes but seafood is all right. 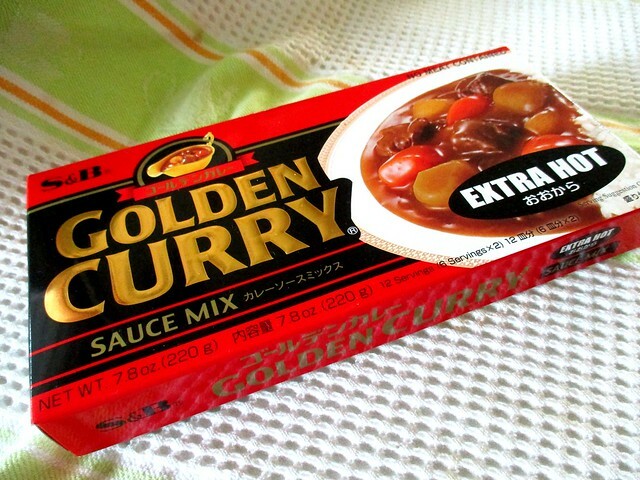 …was very nice. I loved the sauce especially! So far I only came across chicken being cooked this way. …and of course, it was very nice. It certainly was not one of their signature dishes for nothing. 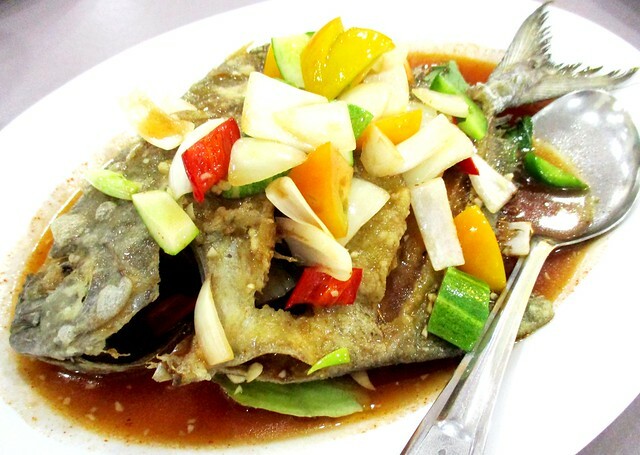 …on our previous visit and since we liked it, we decided we would want it again for a change from the usual fried midin (wild jungle fern) or cangkok manis. That night, I saw some of the employees sitting at a table by the side preparing the midin and my goodness! There was a mountain of it and if all that was for one night alone, their business must be really very good. …and the moment it was served, I know that would cost quite a bit – it was big! Of course, it did not matter at all as it was very nice and we sure enjoyed it very much. 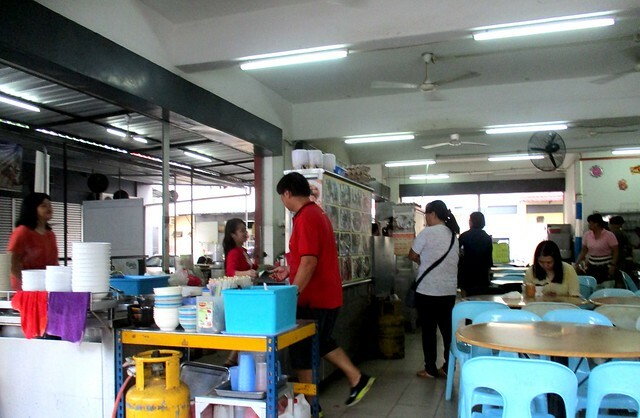 When I went to pay our bill, RM76.00 altogether inclusive of rice and drinks, I asked the lady boss how much the fish was and she said RM31.00 and she apologised that they had run out of smaller ones – normally, it would be around RM25.00 only like the last time when we had the fish. That certainly was a delightful dinner and for sure, we would be coming back again for the simple reason that the food here is, as its name suggests, nice. 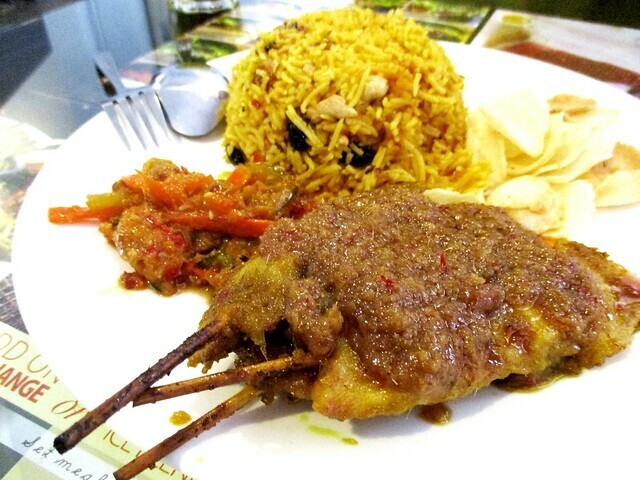 NICE HOUSE RESTAURANT (2.29201,111.82739) is located in the vicinity of the Tunku Osman shops, opposite Rejang Bookstore. Good Friday is a public holiday here in Sarawak so last Thursday, we went to fetch my girl from her school in the jungle and bring her home for the long weekend. Her school or most, if not all, of the schools in the state have taken Easter Monday off as well. We dropped off her housemate/colleague at the airport for her flight back to Kuching and headed to the bank to settle some business and it was already 4.00 p.m. when we dropped by here for a very late lunch/early dinner. 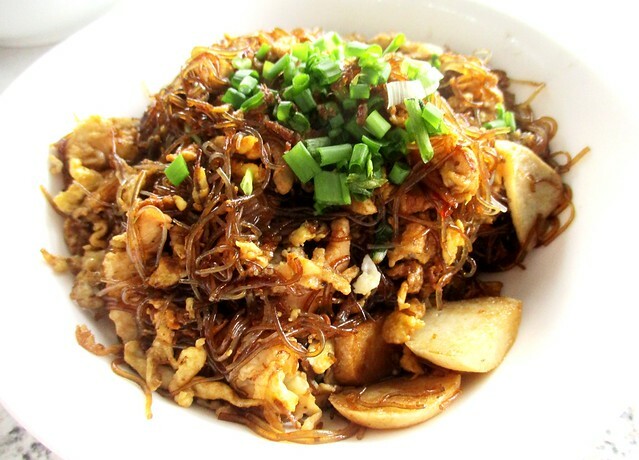 …which I would say is most appropriate as there are very few noodle dishes here and a whole lot of other things. We had not been here for a while, not since October last year as I am not all that fond of the boisterous crowd – it can get so noisy that my head will start spinning and I would not enjoy what I would be having, never mind how nice it is. It sure looked like 4 to 5.00 p.m. would be a good time to drop by as there were not so many people and ample (free) parking spaces all around the building – that is another problem here. You may have to park quite a distance away and walk there. …blended red bean with a scoop of ice cream on top with a few red beans for presentation…and yes, I enjoyed that as well. 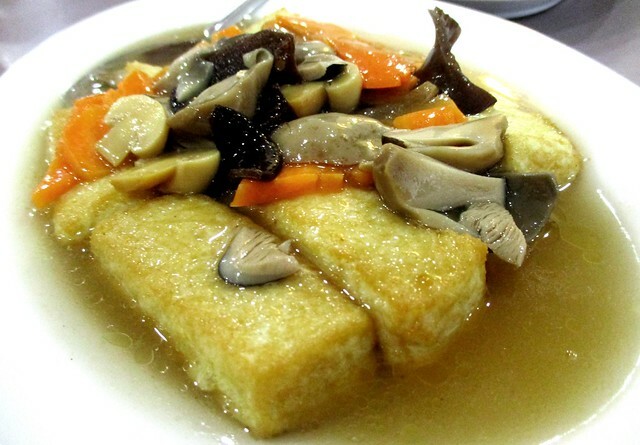 …with tiny cubes of tofu and sweet corn that comes with some of their dishes is very nice as well. …which she said was nice and she did manage to finish most of it, leaving a bit of the rice behind, even though there was quite a lot on that plate. …inside! 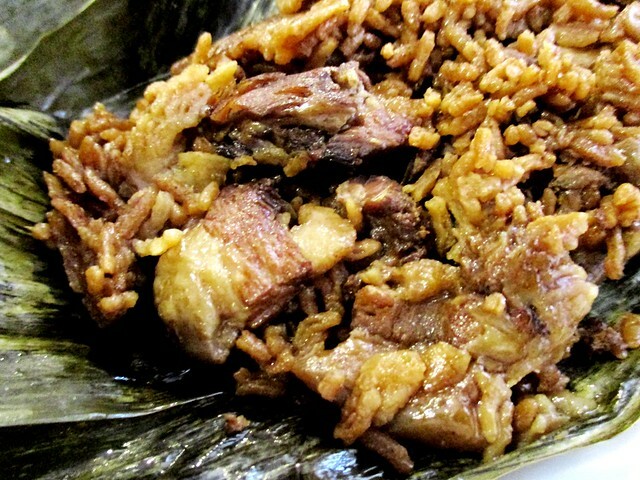 I loved the layers of fat that melted in the mouth but I wished the glutinous rice had been softer and a lot more sticky so it would not come across like ordinary rice – this was most disappointing, I must say. Other than that, at that price, I would not mind one salted egg yolk, a couple of kau lak (chestnuts) and shitake mushroom and a few thin slices of lap cheong (Chinese sausage) as well but there were none so personally, for that kind of money (or less), I would choose rather go for something else on their menu that I would enjoy a lot more. 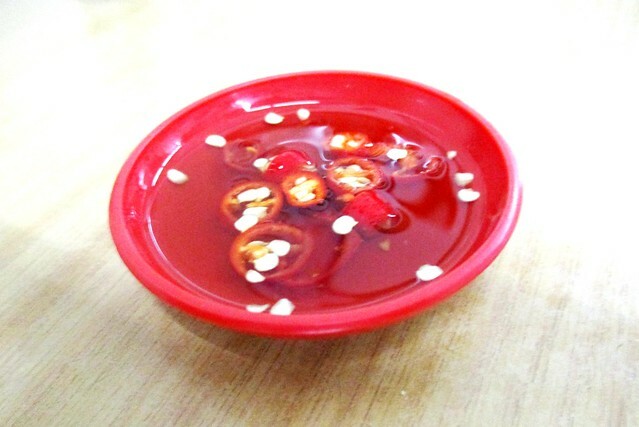 …for a whooping RM46.20 to try. 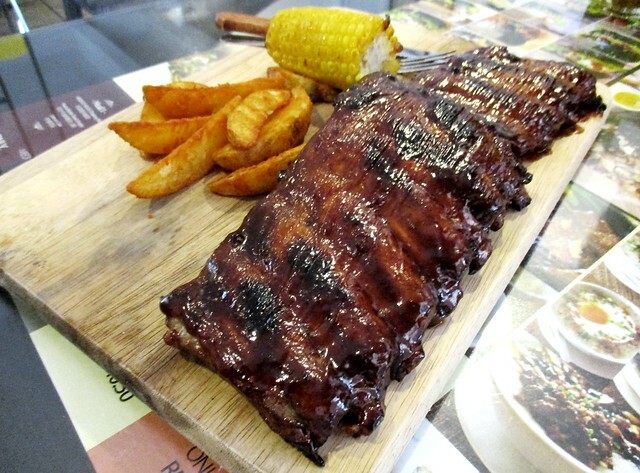 It was very nice but pretty much the same as their barbecued honey spare ribs (RM25.20 only, the last time we had that here) but this one had two of the rack of ribs. Of course we could not finish all of that since we already had our own individual orders so we just had the smaller slab and asked for the other one to be packed for us to take home. There is no service charge (10%) here, just the 6% SST so the total came up to RM107.50 and I just paid RM110.00 and asked the cashier to keep the change. 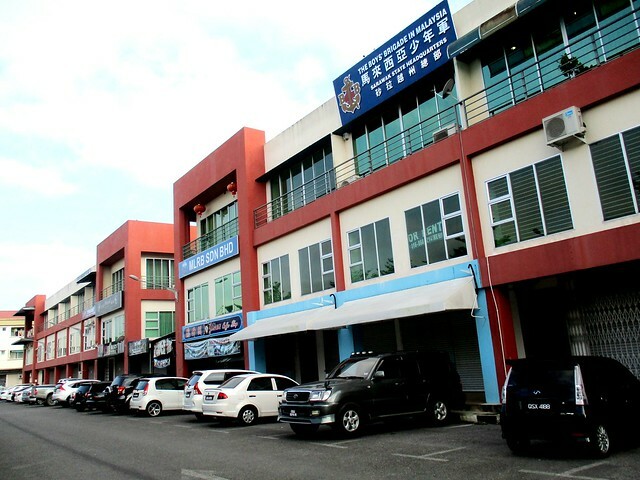 NOODLE HOUSE (2.291406,111.829162) is located somewhere in the area immediately behind the Sibu Central Police Station at No. 2B, Ground Floor, Lorong Laichee 1, accessible either from Hua Kiew Road or Laichee Lane. My missus can’t make chang (meat dumpling). Ummm…let me rephrase that! She can’t tie chang very well – her previous attempts did not turn out too badly but the dumplings came out in all shapes and sizes. I guess she did not have much practice because my late mother-in-law would do it all by herself and my missus would taste those commercially-made and sold ones and would, without fail, declare outright that her mum’s were the best! 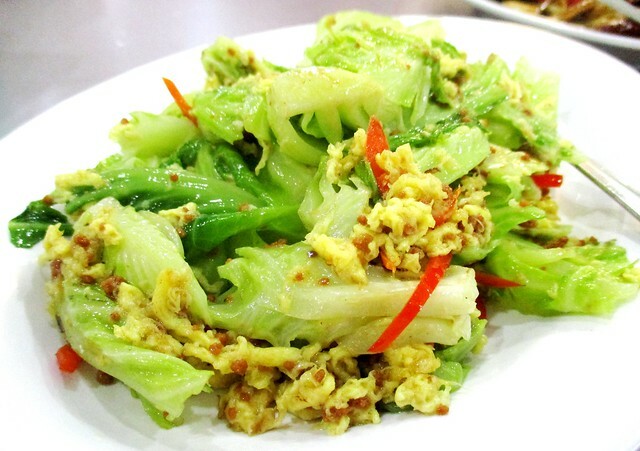 However, they only made the Chinese Hokkien chang unlike my late mum and others in my family – they would make the nyonya variety with ketumbar (coriander seeds). We can’t get those here in Sibu but I would get them every year from my good friend/ex-colleague, Richard or from my uncle’s wife in Kuching or buy those available there. 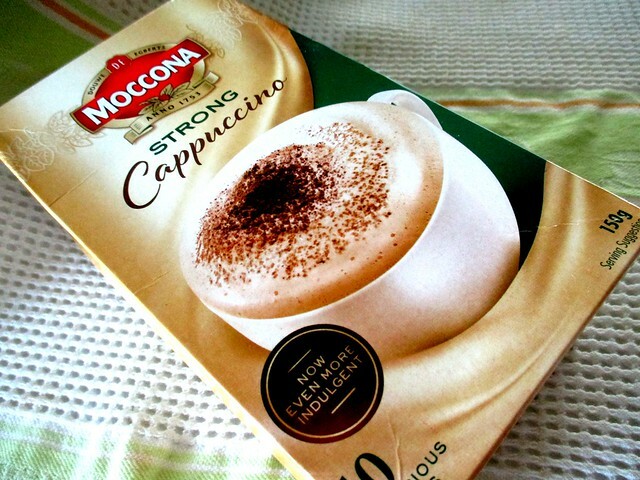 My brother used to buy the ones from Katong in Singapore too when in transit everytime he came home. …and I noticed that it was half white and the other half was a light shade of blue. Obviously, she had made use of the butterfly pea flowers now growing abundantly along the back fence of my garden and we would harvest the flowers every morning (and some of my mint leaves too) to brew a pot of the delightful tea to drink. I did ask her why she made them like that and she said that she saw people doing it that way in some instructional video. So far, I’ve seen those not dyed at all or dyed completely blue or just stained lightly here and there. 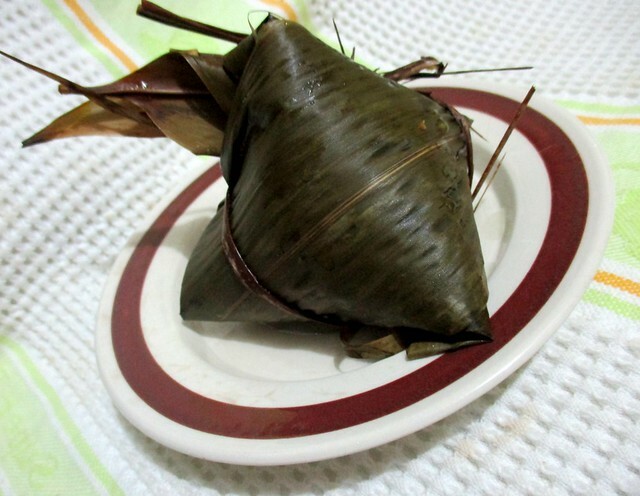 Of course, it did not matter one bit as it was just the colour and did not affect the taste in any way, unlike the little piece of pandan that she put inside – the fragrance of the leaf sure brought the taste to a whole new level. 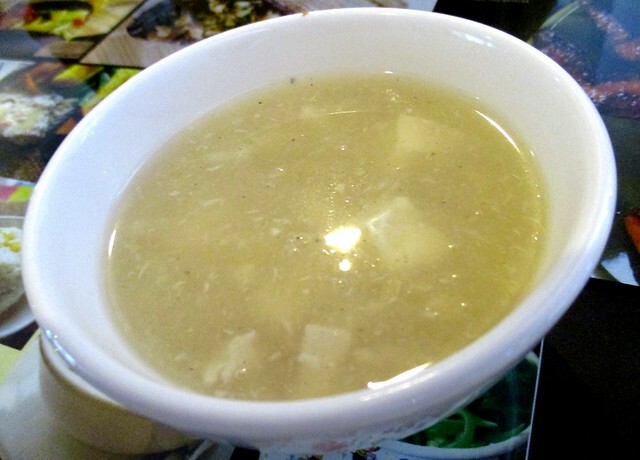 …was great, a little sweet with the addition of the dried winter melon (冬瓜糖) and yes, I must say that I sure did enjoy eating those changs that my missus made a lot! 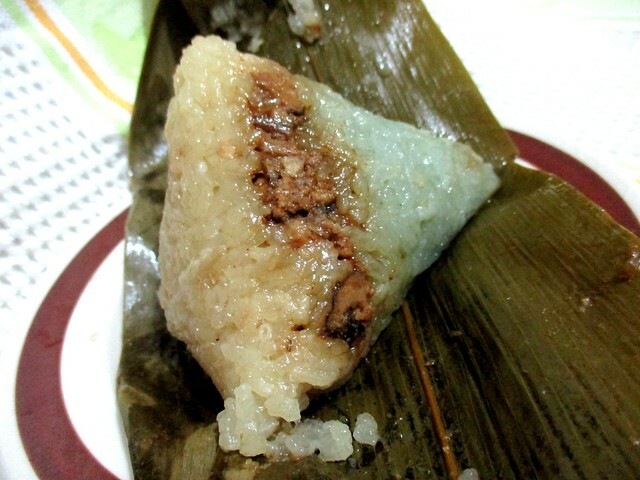 Yum yummm!!! 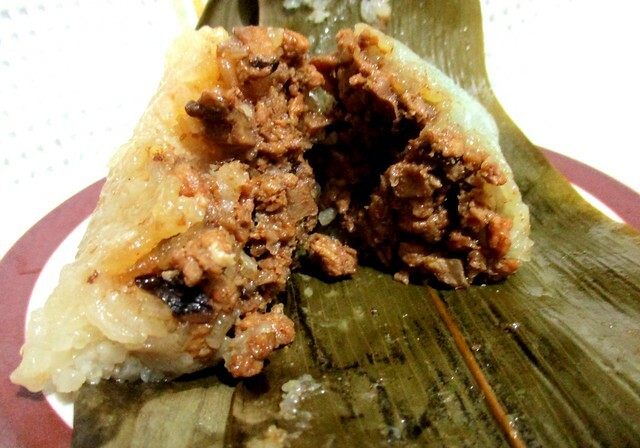 Of course it was a whole lot of work and those of us who do not know how to tie those dumplings would take the easy way out and cook it in a baking tray, the glutinous rice with a layer of the filling in between. 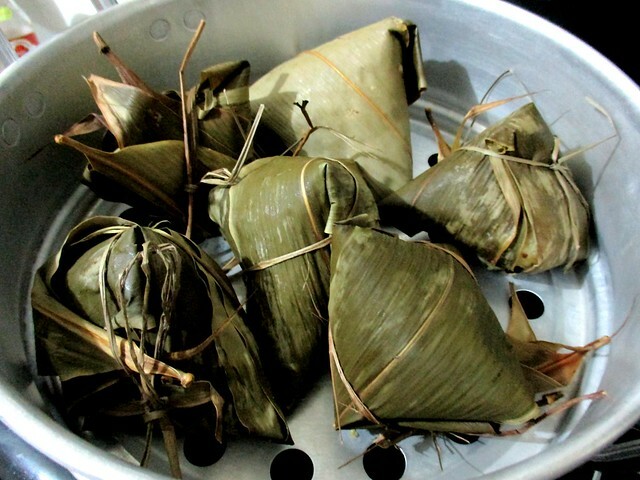 I told her that she could cook the glutinous rice and the filling the way her mum would do it for her Hokkien chang (yes, my missus does not have a problem with that, just the tying) and cook it in aluminum foil cups like Lo Mai Gai (糯米鸡). 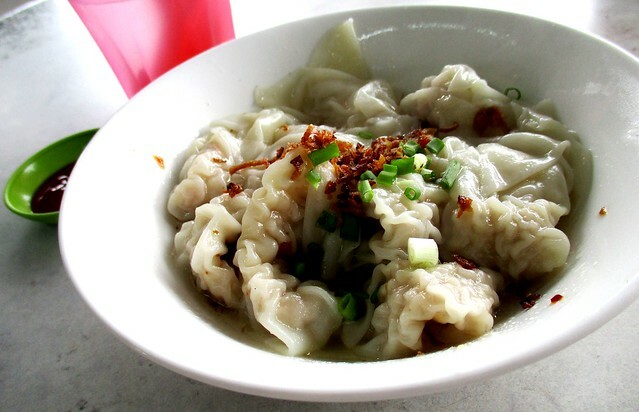 That way, she would not have to go through the tedious task of tying the dumplings. I started my blog on the 7th of March, 2008 so that means it is now a little over 11 years old. I just do it for fun, just to keep a record of things going on in my life and to stay mentally active so I will not turn senile or suffer from dementia all that soon. No, despite many people urging me to do so, I simply refused to monetise my blog – once you do it for the sake of money, it will lose its character and its charm and here, you do not get invited to events like food tasting, the opening of a new eatery in town or the launching of a new menu and the like, not that there are many/any. Wherever I go and eat, I will have to pay out of my own pocket s0 what I think is good (others may think otherwise), I will say so and when it is not that great (and others may think otherwise too), I will try to put it across gently by highlighting what may be praised and mention subtly what is not or may need some kind of improvement. For one thing, over the years, I have made a lot of friends from all over the world through blogging. There were many who were with me when I first started – most have fallen by the wayside, no longer active and only a couple remain. In the meantime, through the years, there were others who came and went and lately, not that many people will drop by every day, less than 1,000 but that does not deter me in any way. As long as I am enjoying it and there are still people who are interested around, I shall keep on doing what I’ve been doing for so long now. I have a friend in Perth – I think he’s originally from these parts but he lives there now. I first met him in 2014 at one place that I used to frequent a lot before, when he came back for Chinese New Year and had gone there to enjoy the food. He came over and introduced himself and asked if he could have his photo taken with me. That sure was a pleasant surprise and of course, I could not say no. He was back again the following year, 2015 and we met on board the plane when I was on my way to Kuching, just fancy that. He was back here again in 2016 and because I was always complaining about there being no fresh beef here, just the frozen imported ones, tough like leather, he brought me some all the way from Australia, believe it or not. I did not hear from him anymore after that except for the not-very-frequent posts he would share on Facebook once in a long while and I sure was taken by surprise that day when he messaged me via Facebook saying, “I will be going back this Saturday. Have bought some goodies for you. Ok for me to pass to you on Sunday afternoon? I know you need to send your daughter to her school in the jungle.” I was puzzled, of course as I understood that he was here, going back to Perth on Saturday so how on earth would he be able to pass me the things on Sunday when he had already left town. It turned out that he was in Perth, coming back here on Saturday and yes, he dropped by my place around 5.00 p.m. on Sunday like he said he would – I got his message right after I had got up from my nap, via Facebook to let me know he was coming. We would usually get home at around 3-4.00 p.m. after we have dropped off my girl at her school…and when he came, goodness gracious me!!! Wake me, somebody! Pinch me! I must be dreaming!!! This time around, he brought a big bag filled to the brim with all sorts of goodies from Australia just for me. 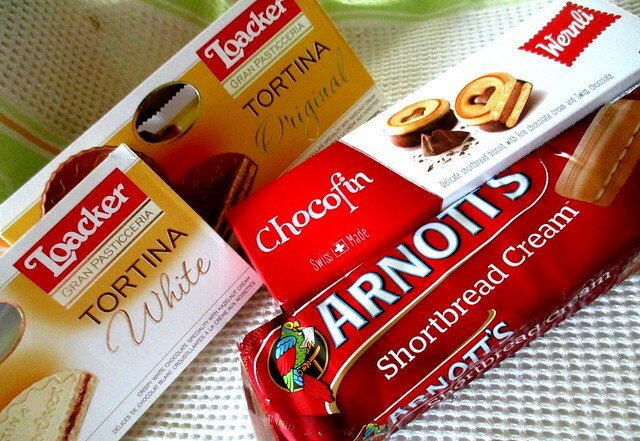 – I have tried the Arnotts Shortbread Cream and they were very nice. 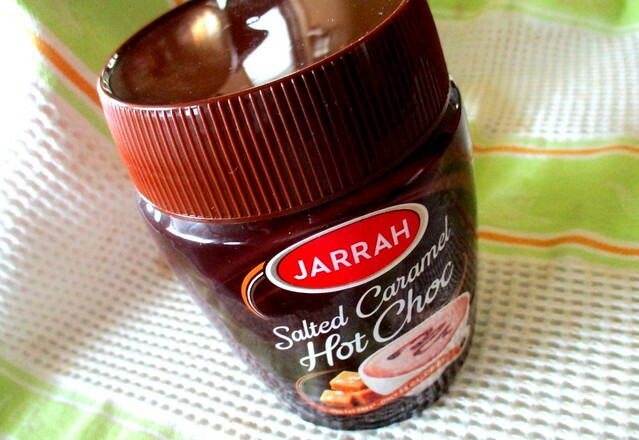 We do have that supermarket in town that will stock up on imported goods and we may get these from Arnotts but I will usually wait till the expiry date draws near when there may be some special promotion whereby these will be going at more affordable reduced prices. …for her night cap in her quarters. 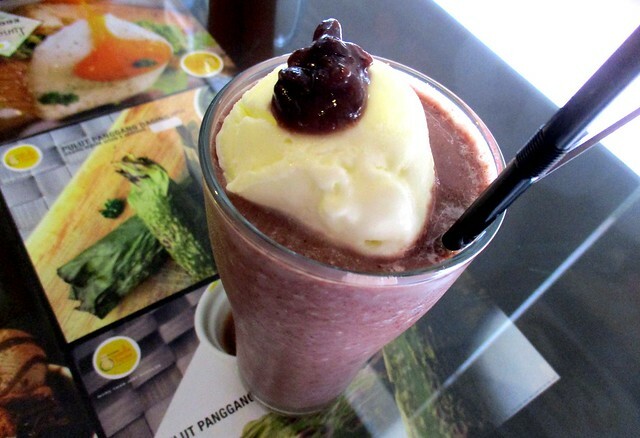 She usually buys Milo or chocolate milk and brings it along – now she can get to enjoy this. 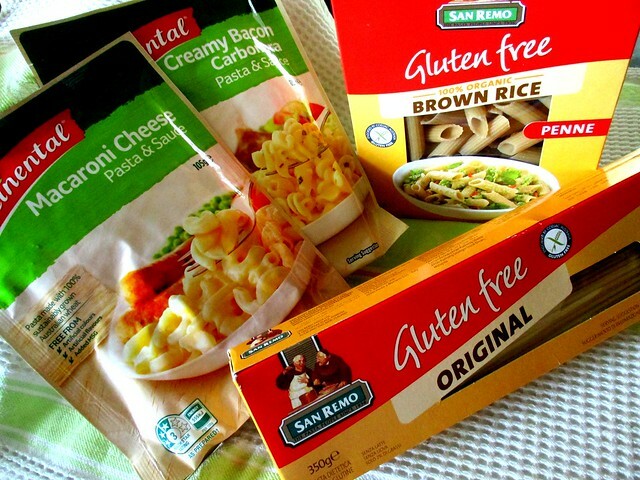 …too, the gluten-free pasta and those instant ones. Macaroni cheese, that’s her favourite! Incidentally, she went for a blood test, over RM1K and they had to send everything to KL to be done and the results came back after quite some time and it turned out that whatever allergies there were, it would be very minimal…so we reckoned it was an overdose of oats, breakfast, lunch, dinner and supper that triggered what looked like symptoms of gluten intolerance. Now she has gone back to eating the regular wheat stuff but I told her to do so slowly as she had been off those for around a year already, at least and the body would need to re-adapt to its re-introduction. 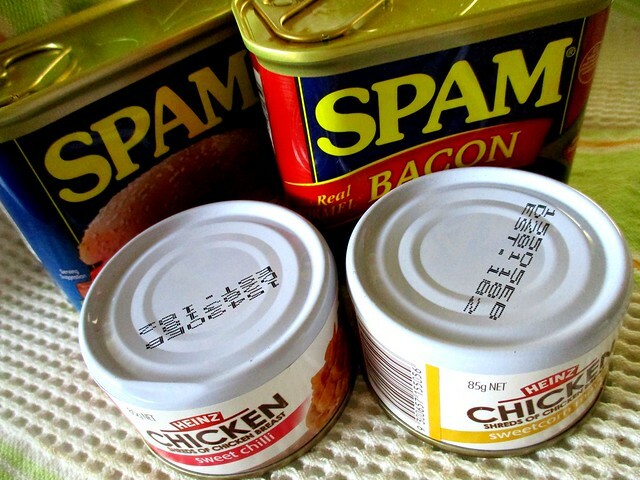 …and chicken – I know Hienz, we get their baked beans here. I did not have anything in the house to give in return except for a packet of the Sarikei Jakar sio bee (meat dumplings) and I thought that would do, not expecting my friend to bring SO MANY things! I actually felt quite embarrassed to give him that but I did not have a choice since I did not have much else at that point in time. Thank you so much, my friend, for carting all that stuff all the way to give to me – that was so kind and generous and so thoughtful of you but please, next time, a little something will do…or some nice words like what you said that evening, “I read your blog every day!” That sure made me day, thank you! I mentioned in my previous post that the workshop boss had undercharged me for the tyres and the services rendered so early on Monday morning, I made my way there to pay him the balance. …on the way for breakfast instead of going straight to the shop to wait for him there. The café next door has since moved here and the premises is currently available for rent. We’ve been here a few times before, once in search of the green moringa noodles but it looked like the stall had closed down or moved elsewhere. In its place, there is a young boy selling various kinds of toasts that seemed quite popular but I was not in the mood for that that day – another time perhaps. …and they were very good. 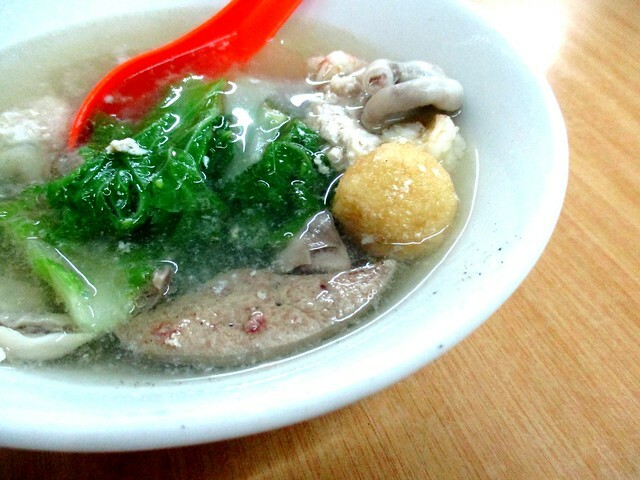 We liked in particular their own-made fish balls/cake, bay kar (ikan tenggiri/mackerel) no less. …and yes, it was good. 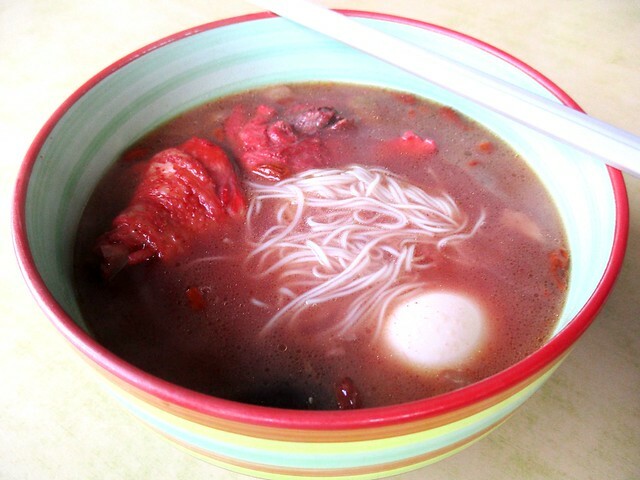 …one should get when having mee sua at the coffee shops. 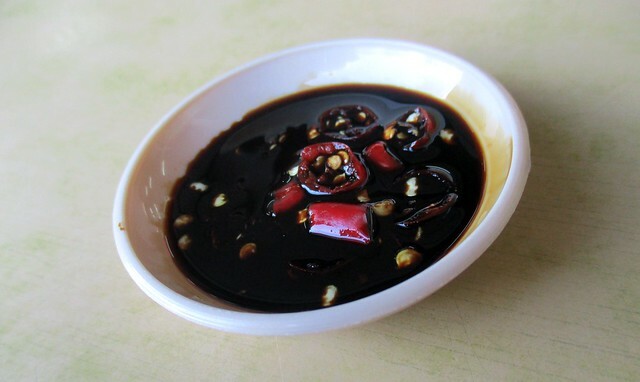 I get quite mood-spoilt when they simply give bottled chili sauce with dark soy sauce added because that shouldn’t be the way. I was not too pleased with the quality of the red wine used though – it was a bit sour and not all that fragrant so even though it is 50 sen more expensive here, I would much sooner go for that one. Once I was done, I headed to the workshop and yes, the boss had just arrived. He collected another RM120.00 from me, so that worked out to RM720.00 altogether for all 5 tyres and the SOS service. RM120.00 for a tyre? That’s really cheap, don’t you think? Well, if anyone is not too happy with his/her mechanic, you can drop a comment below and I will give you the details – I am pretty sure that like me, you will be very happy with this one. 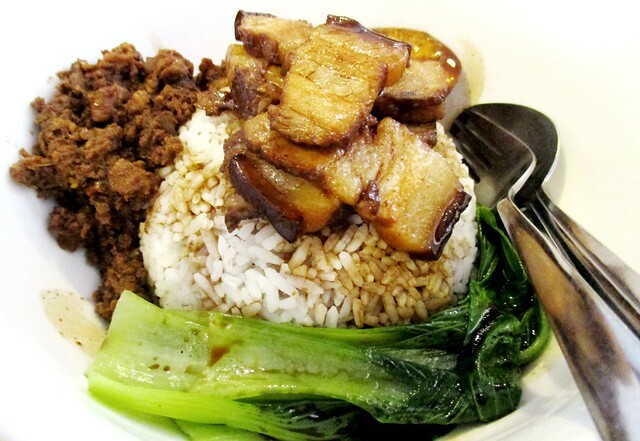 YISEN CAFE is located opposite the Lovers’ Bridge along Sungai Merah among the shops to the left of Jalan Teng Chin Hua before its junction with Lorong Sg Merah 2. Unlike at many parts of town these days, there is ample parking here and it is free. I called the workshop boss and asked him to come and help with specific instructions to bring their own equipment. My spare tyre in the boot was fine – I checked the pressure all the time whenever I checked all the four wheels prior to our drive all the way to my girl’s school and back. However, the jack and what not had gone all rusty as I had never used them all these twenty over years ever since I bought my car and I did try it once not too long ago and it would neither go up nor down. In the meantime, a young and handsome Malay guy in army uniform came on a motorbike and he said he could help to change the wheel. That was so very nice of him! I told him the equipment I had could not be used and anyway, I had sent for people to come and they were on the way so he turned back and went back the way he came from. I am not sure if he came from the army camp not too far away along that road but it got me wondering as to how he came to know there were people in distress at that point in time. A God-send angel coming to our aid? 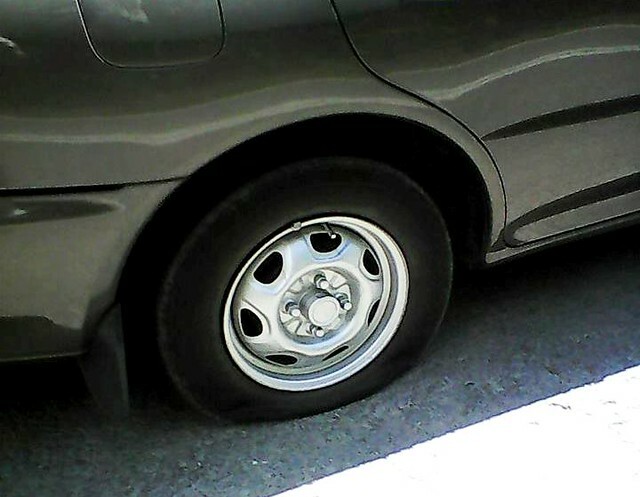 Well, the guys from the workshop showed up in around half an hour and they did what they had to do and I told them to take the wheel back, get the tyre replaced and I would drop by the next morning so they could put it back and the spare tyre could go back into the boot. They did say that the tyre had long expired and the one on the other side (back) as well and the spare tyre was even older. I decided to go and change all the tyres to brand new ones even though the guy at the tyre shop kept saying that the ones in front were still all right. I asked him how long a tyre would be good for and he said around three years – the ones in front were from 2016 and despite what he said, I insisted that he changed the two as well. Safety sure has no price, I’m sure everyone would agree with me on this. …for a bite to eat. The chu char (cook & fry) stall here does not sell noodles, just rice and dishes so I thought I could just have a plate/bowl of kampua mee from the stall in front. …It was all right, quite plain with nothing much more than some fish balls slices and a lot of egg but it was pretty ok with the chili sauce provided. …and this, I would say, was good, as good as any of the good ones I have had around town. After having had my fill, I went back to the workshop to pay the boss – he was not around earlier as I was real early but a few of his workers were already there and were able to handle all the dealings for me except that they did not know how much I would have to pay. Much to my surprise, the boss asked me for only RM600…for 5 tyres and the SOS service the day before (and that was quite far from town, around 10 miles). I paid and went home, still puzzled as to why it was so cheap. If it had been for the tyres alone, that would be RM120 each – no tyres can be that cheap these days, no way. When I got home, the boss called me and said that he had charged me for 4 tyres only instead of 5 and when I asked him, he said it would be over a hundred more. I had not gone back to pay him at the time of writing but I still think it was rather cheap and with the great service, I certainly would not want to go elsewhere…ever. 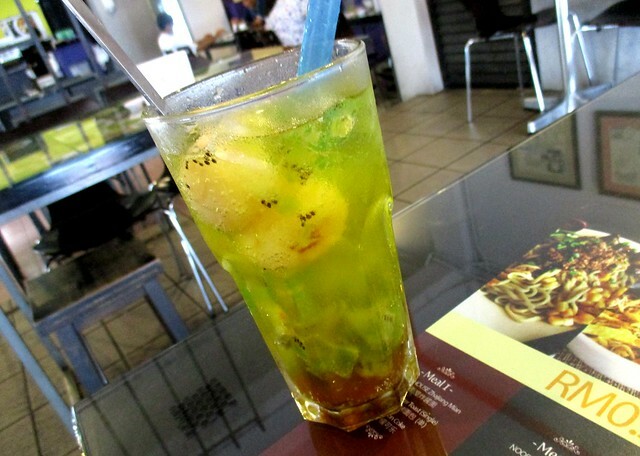 SYARIKAT KIONG CHUONG CAFE (2.291062, 111.827381) is located along Jalan Kampung Nyabor at the bend where one turns left or right when coming from Brooke Drive, a stone’s throw from Malaysia Hotel in the next block. I went and googled and ended up at their Facebook page. Much to my surprise, many of my foodie friends had been here before, their posts dating back to 2012! 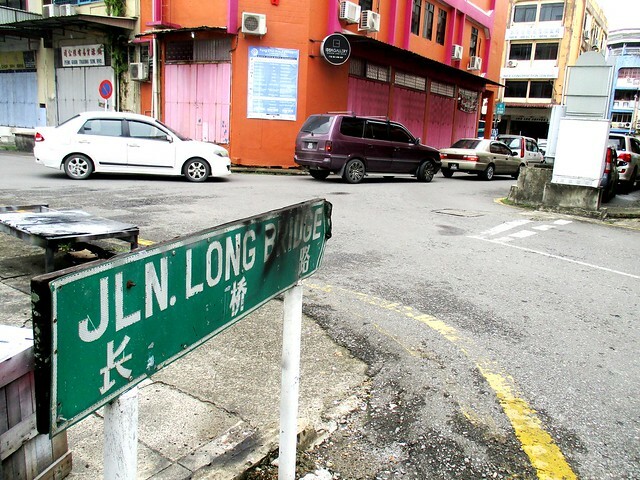 If you come in via Jalan Long Bridge proper, you will have to turn left at the t-junction – it is a one-way street so you cannot turn right to get here. There was an old couple running the stall in front, a very very thin old man and an equally thin wife…and looking at how animated the man was, moving here and there, doing everything so fast, I must say that I was not in the least surprised he was so skinny. The orders did not get served that quickly though, unfortunately…so one would have to wait…and wait…and wait for a long time to be served. Word has it that the guy is from Kuching and it sure looks like he has brought along with him that “worth its wait in gold” policy at one place there. 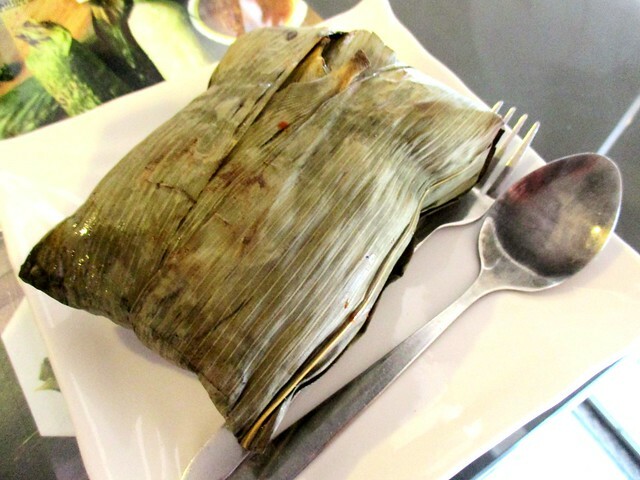 As a matter of fact, what I was served eventually was more or less what one would get at that place in Kuching or here – I think my blogger friend, Rose, will drop by the latter sometimes. …and yes, it was very nice – very original/authentic, very nicely done but I think my favourite in town remains unchanged. …I was delighted that it was something like those at the aforementioned places in Kuching and yes, it was very very nice. The soup was so rich with the bone stock, as nice as that of the old lady’s meatball soup but sadly, she has retired and her daughter or whoever has taken over her place and the last time we dropped by, everything was somewhat disappointing so we never went back again. 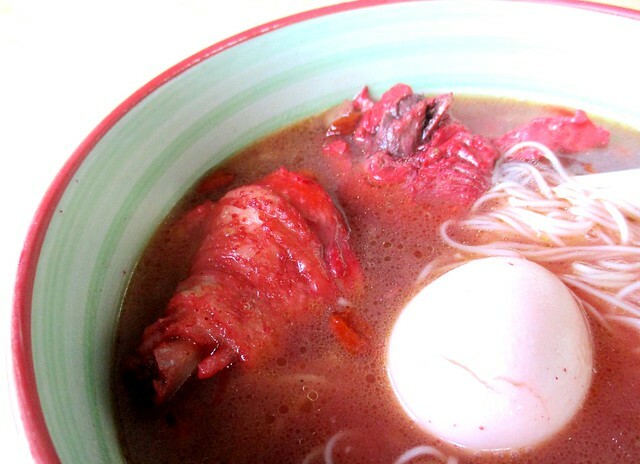 I sure enjoyed this one to the max, especially with all the innards in the soup and I was wishing there were some pig’s blood too but there was none. It so happened that while I was there that morning, I met the boss of a printing press in town with a group of people. I was in charge of the publication of the school magazine before I retired and without fail, he would see me year after year after year…and he went and paid for what I had! 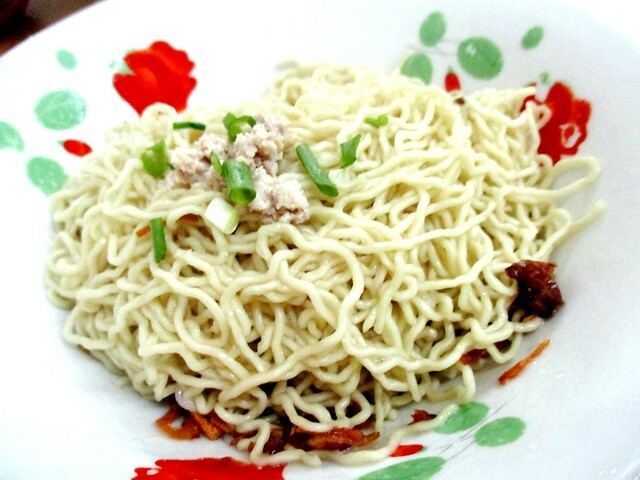 I asked the guy’s wife when she was serving me how much the mee and the soup were altogether and she said RM6.00. Gee! That’s really inexpensive, don’t you think? I certainly would not mind coming back here again for more but I was quite put off by the crowd even though it was so very early in the morning, between 7 and 8…and of course, I am not all that keen on waiting that long all over again. It looked like the main attraction was the guy’s porridge – everyone else was having that – I was the only one having the noodles and soup, and an Iban guy at the next table who had the noodles in the soup served in a very big bowl. Other than that, this is a very congested part of town and parking can be a real pain. All things considered, I guess it will be quite a while before I venture to that part of the woods again. 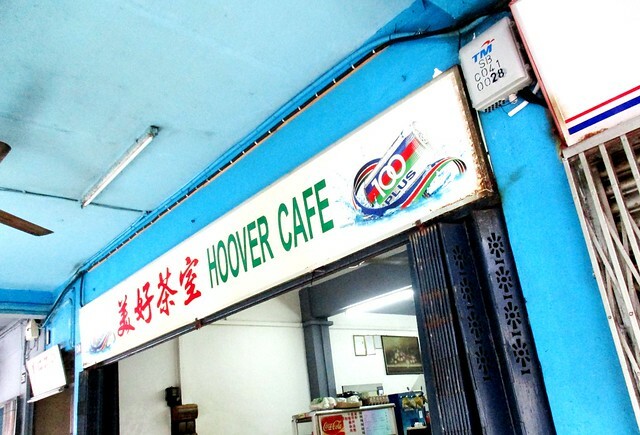 HOOVER CAFE (2.285696, 111.831327) is located at Jalan Long Bridge, off Jalan Tan Sri. 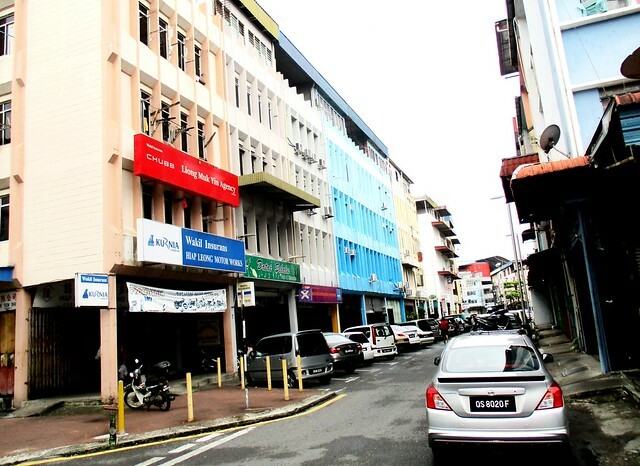 The back of the coffee shop faces the back of the shops along Jalan Maju where Hai Bing Seafood Restaurant is located, facing the Rejang Esplanade.